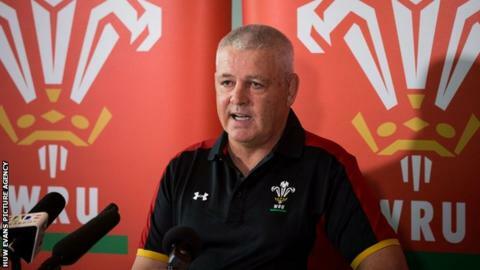 Wales coach Warren Gatland says Welsh regions' failure to reach the Pro12 play-offs gives added importance to the match against England on 29 May. The teams meet at Twickenham before Wales tour New Zealand and England travel to Australia. Twenty-six of the squad play in Wales and will not play before Twickenham. Asked if he was concerned his players might lack game-time ahead of the tour, Gatland replied: "That's why the England match is there." He added: "In the past we've had players who have come in to the squad and wouldn't have played for four or five weeks. "We identified it about 12 months ago because we've felt in the past we've gone on tour and we've been under-cooked. "For a lot of these players getting a run under their belt at that level and that intensity then hopefully we can hit the ground running a bit more and be prepared for that first test." Wales' four regions - Scarlets, Blues, Ospreys and Dragons - missed out on the top four in the Pro12 with only Scarlets qualifying for the European Champions' Cup. It is the first time Wales has been represented by only one team in the top-flight European tournament. "Everyone would agree it's been disappointing," said Gatland. "I think the relationship between the union and the regions is the most positive it's been for a long time, so we've got to build on that. "From our point of view you want to see more than one regional team in the highest echelon of Europe for a start, and you'd like to see one if not more making the semi finals of the Pro 12. "It's important for the regional game and from our point of view to having players come into the national team from sides that are doing pretty well - they come in with a spring in their step and a bit of confidence." Are there any selection issues? Wales could be without France-based players Jonathan Davies and Luke Charteris against England, with either Tomas Francis (Exeter) or Bradley Davies (Wasps) likely to be involved in the Aviva Premiership final on 28 May. The match is likely to see the return of Alun Wyn Jones to the rugby field for the first time since England's 25-21 win over Wales on 12 April. Gatland hinted that the team to face Eddie Jones' Six Nations Grand Slam champions will be selected with an eye on the first Test against New Zealand two weeks later. "If we've got to tinker with a few selections we'll do that for the England," he said. "It's about getting the balance right when we put a side together and also thinking two weeks down the line in terms of that first test against the All Blacks in Auckland."